Photos, as the alternative to iPhoto and Aperture, is well-crafted to improve Mac users' photo management experience to a new height, farewell to the messy interface, gaudy features and snail's pace. There is 85% likelihood that you would give Photos for Mac high marks (e.g., 8 scores out of 10) once you use it to organize & edit images on MacBook Pro/Air, Mac Mini, Mac Pro, iMac (4K/5K), iMac Pro and compare Photos with iPhoto or Aperture. Unconvinced? Give it a try after you read the complete Mac Photos tutorial. Create/edit/delete files & playlist; make iPhone ringtone; mount iPhone as drive. To use Photos app on macOS, the first thing you need to do is to upgrade iPhoto or Aperture to Photos and download Photos app on MacBook or iMac. After the downloading and installation process is finished, fire up Photos on macOS to start a new journey to organize and edit your pictures. When you launch Photos app on Mac, you will see all your photos are managed by Moments, which means the photos shot at the same time and same place are organized together. Of course, you can also choose "Image" at the top menu banner of your screen and then click "Adjust Date and Time" to change the date and place of your photos so as to organize different photos into one "Moment" collection. On top of "Moments", there are also other options for you to view photos on macOS, just similar to the Photos on iOS, including Collections, Years, Shared, Albums, Projects, etc. If your pictures are too many, you can directly type the image title on the search box to find it. In case there is still no search result, navigate to "Albums" on the left-hand of Photos interface > tap "Hidden" album to find the hidden protected images. Or go to "View" at the top toolbar of your desktop > choose "View" > "Show Hidden Photo Album" to find the album you need. Alternatively, you can just select "View" option at the top of screen to change the interface of Photos, for example, Show Sidebar, Hide Sidebar, Show Face Names, Keep Sorted By Title, Zoom In, Zoom Out, etc. Try more to adjust Photos interface to the one you like. New Album: 4 subgroupings are covered, New Album, New Empty Album, New Smart Album and New Folder to better classify pictures into different albums. Create Projects: you can create book, card, calendar, slideshow and order prints based on your budget (from $0.12 to $17.99). Import: this allows you to import images from macOS to Photos for Mac app. 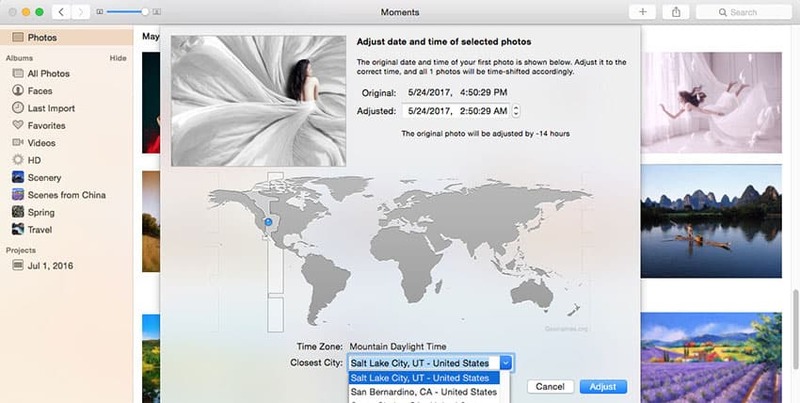 Export: backup pictures from Mac Photos app to MacBook, iMac, iMac Pro, Mac Mini, etc. Close: click to shut down this photo management software. Show Recently Deleted: it resembles Photos for iOS, which is aimed to help you recover the recently deleted pictures or completely remove images. 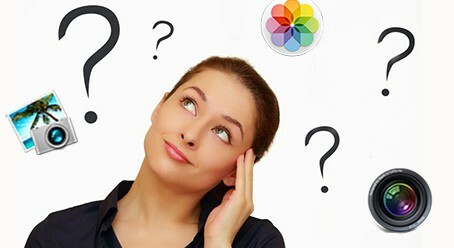 Note: the above Apple Photos tutorial introduces the basic features to you, no further explainations on the self-explanatory items. Yet, here one item is still needed a deeper explaination. That is Smart Album. Different from the ordinary Album, Smart Album can automatically gather the info matched images into the same album without your manual selection. See, as long as you choose the subject (photo, album, date, face, description, title, file name, text, Aperture, etc. ), predicate (is or is not) and predicative (favorite, hidden, edited, movie, RAW, referenced, tagged with GPS), then the conditions qualified pictures can automatically be organized into one smart album. That's quite time-saving, isn't it? Mac Photos app does a good job in photo organization. How about photo editing? How to use Photos on Mac to edit pictures? No rush, this part centers on this topic and will walk you through the whole Photos tutorial from 2 aspects: basic edit tools under "Edit" and advanced edit tools under "Image" on top toolbar. Undo Delete Folder: recover the deleted folders back to Album column. Copy: copy any picture and then directly right-click to paste image to MacBook or iMac. Select All: one click to choose all the photos. Find:: direct you to the search box and you can directly type the image name to find. Spelling and Grammer: check the spelling and grammer of your image title, description or text. Emoji & Symbols: all sorts of emojis and symbols are available for you to add to favorites. Enhance: intensify the whole effect of the picture. Rotate: rotate picture in counter-clockwise. Crop: cut off the unwanted image parts or black bars to shrink image to suitable size. Filters: 8 special effects for you: Mono, Tonal, Noir, Fade, Chrome, Process, Transfer and Instant. Adjust: click this item to adjust picture light, color and black & white. Retouch: this feature resembles Clone Stamp Tool in the Photoshop. Red-eye: a common tool to correct the red eyes back to normal eyes. Note: Photos is one of the greatest photo organizing software to let you organize photos, videos and edit photos. However, if you wanna use it to edit your videos on macOS, sorry to tell you that the current Apple Photos for Mac hasn't featured this power yet. Good news is that there are scads of excellent Photos alternative like MacX Video Converter Pro armed with video editing feature to satisfy your needs. MacX Video Converter Pro is a professional video converter, video downloader, slideshow maker, as well as a video editor to help you compress and shrink video file with 20%-90% size off with no significant quality loss, crop video to cut off unwanted video black borders, trim video to free adjust video Start/End time, rotate video 90/180/270 degrees, add SRT subtitles to video, add watermarks to video, change video aspect ratio 4:3 to 16:9 or vice versa, adjust video resolution 720p, 1080p, 4K 2160p, split video, merge videos into one, etc. If you make a photo slideshow on macOS, you can directly go to "Projects" column and find the slideshow. Give it a click on the "Play" icon and it begins to playback with full screen. As for the albums, though you don't create photo slideshow, you can still playback it via the right-click on mouse. 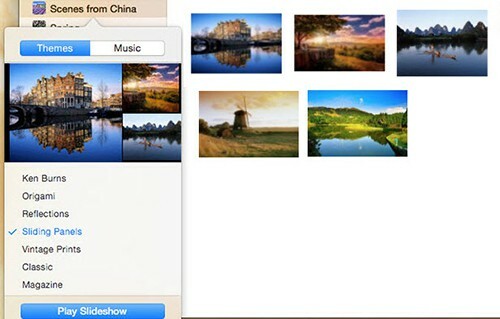 Afterwards, Mac Photos app will pop up a small window with "Theme" and "Music" options for you to choose from. Last step, tap the "Play Slideshow" button. Themes: ken burns, origami, reflections, sliding panels, vintage prints, classic and magazine. Music: iTunes or Theme songs. The current photo sharing website and service are very popular. And these SNS sites become significant ports for people to show their lives and communicate with others from the whole globe. The most common SNS platforms are Facebook, Twitter, LinkedIn, flickr, etc. Now, with Photos on macOS, you can directly choose the image > right-click to select "Share" or tap the share icon at the top menu of Photos to share your edited image to iCloud Photo Sharing, AirDrop, as well as Facebook, Twitter, flickr, Vimeo, etc. with dozens of thrid-party extensions supported.